This latest installment of the long-running series starring Aloysius X. L. Pendergast, oft-rogue FBI agent, is unlike so many of the authors’ previous works. Fans of the series have come to expect Pendergast to delve into cases that flirt with the mystical, occasionally delve into the paranormal, and frequently feature macabre murders and even creepier villains. 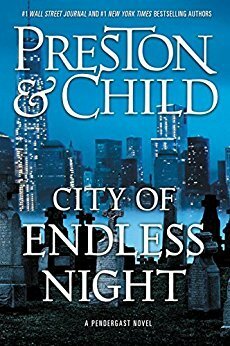 I am happy to report that while City of Endless Night breaks this mold, the story does not suffer for it in terms of action, suspense, and chilling details. Pendergast, ably aided by sometimes-partner Lieutenant Vincent D’Agosta of the NYPD, investigate a series of murder/decapitations that present more questions with each subsequent victim. Is there one killer at work? Two? A copycat? Or even more? The bodies pile up, the suspects dry up, and D’Agosta feels the pressure from the mayor and the police brass, but he’s left flailing by Pendergast who is inexplicably off his usual game. The novel lacks Pendergast’s usual trip into his mind palace to find hidden clues; instead the preternaturally cognizant detective seems distracted, even disinterested at the beginning of the story. This turn of events actually helps the plot though; no hint of the actual killer is given until three-quarters of the way through the book. What follows is sheer classic Pendergast-a manhunt with an intelligent, cunning, and utterly ruthless murderer who seeks the ultimate “big game” hunt, pitting himself against a quarry he considers worthy of his attention, Pendergast himself. I award this latest Pendergast thriller five stars, and am happy that although this is the seventeenth addition to the series, the authors have found a way to keep the characters fresh, and the plot both entertaining and unpredictable.